THEY may have been seen as a group of messers at the start of the year but under the steadying influence of manager Ken ‘Jacko’ Brophy, Athy lifted their fourth minor title in six years after defeating Two Mile House. Athy only made the final after a dramatic semi-final win over a fancied Sarsfields and Foley felt that the confidence gained from that game was key to their victory on final day. “I think the Sarsfields game in the semi-final stood to us. That was an unbelievable game, it went down to the last minute of the game. Fair play to Two Mile House, they went to a replay with Naas. It stood to them as well and that’s probably what made it such a great game in the end,” he said. Like Foley, the majority of the squad are underage again next year and with the talent that is there, he can see further success in the future. 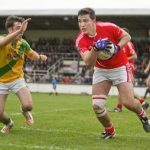 Athy has really become a football hotbed in recent years with success at minor, under-21 and senior level. “It means a lot to the people of Athy,” said Foley. “Football is everything in Athy. Rugby and soccer are big sports as well but football is the heart of the town. Everybody wants to be involved in it, parents want their children playing in it. It’s a great achievement to be here today.